Jesus died for our sins. 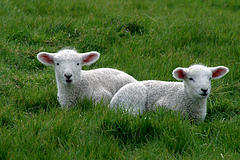 Lamb of God takes away the sins of the world. As much as that was repeated to me growing up, and as innocently as I believed it, I never really comprehended how it could work. Why should killing God produce any positive effect at all? Wouldn’t that be rather a black mark? Anyway why does someone dying impact someone else’s sin? Today I learned the answer, and it hit me like a smite of lightning. Afterward, I wasn’t sure whether maybe I was the only Christian who didn’t get it, but I just checked with a couple friends and found out I’m in good company. In superstitious times, forgiveness was obtained through magical rituals. Most of these assumed that guilt could in some fashion be transferred to an animal or other being, which was then killed or driven off to provide a symbolic expiation. Jesus’ divine blood, shed once and for all, makes a more perfect sacrifice than an animal’s and does not need to be repeated. Still, at the heart of Christianity lies the same ancient superstition: that one person’s guilt can be transferred to another and then absolved by punishing that other. Eureka! So it turns out the answer is, it’s not supposed to make sense, it’s just the way the magic works: You can shunt sin between people and animals like “guilt capacitors”. Now I understand the point of ritual animal and human sacrifice too. All this time I thought that sacrifices worked because killing an animal or person takes the being away from us and sends it up to God (who apparently has an insatiable need for slaughtered slaves, virgins, or fauna, depending on your tradition). But it’s really just this transference of punishment deal. God doesn’t want all our dead stuff, he just wants something to take the rap for our evil deeds, regardless of actual deservedness. Come to think of it, I see why teachers of Christianity might not want to focus too closely on the mechanics of sacrifice. Although elucidating in a historical way, the bare explanation could have made me question my faith a lot sooner. I just learned there are terms for this concept: propitiation or expiation (depending on the details of what you’re discussing). There is something else to consider when asking why God would use his son, Jesus, as propitiation for our sins. If God is all powerful then he makes the rules. It doesn’t have to make sense to us. If you stipulate that we are too dumb to understand the rules, you can trivially rationalize anything. But it’s not a very satisfying explanation to me.